Simone Well said, The love of our neighbor in all its fullness simply means being able to say to him, "What are you going through?" We all have neighbors. In real life. In blog life. We are all going through stuff. In real life. In blog life. One of my very favorite bloggy neighbors is Amy of the Never-True Tales. Amy is a terrific writer and thinker and each and every time I read her words, I feel enriched and inspired. Amy is also an innovator and connector. Acknowledging that blogging is as much (or more) about community as it is about self-study, Amy started the wonderful Won't You Be My Neighbor Series? When Amy asked me to visit her at her delightful blog, I was honored and thrilled. And so. Today, my words and I will be chilling next door at Amy's. Please read what I have to say - and ask - about the human impulse to hide and seek, leave a comment, and then get cozy. Amy's blog is a gem and it's worth poking around for a bit. Also, check out her fabulous blogroll for some new brilliant bloggy finds. Do you think blogging is as much about community/conversation/connection as it is about self-discovery? If it were all about self-realization, wouldn't we just write in journals and Word Documents? 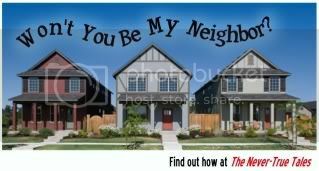 Do you agree that being a neighbor - online or off - boils down to a simple and thoughtful concern for the welfare of ourselves and our peers? Do you read blogs to see what others are going through? Do you write your own blog to reveal (to yourself and to others) what you are going through? Do you feel more of a sense of community/neighborhood in your physical life or in your digital life? Do you agree that real life is blog life and blog life is real life? Apr 22 I Am Thoughtless. I Am Thoughtful.